Owning a Vizsla will change your life forever. The Vizsla standard calls for the breed to be “demonstratively affectionate”, and whether he is jumping up to lick your face, grabbing your wrist in his mouth, sharing your bed, dinner, chair, or lap, or just being a favorite toy, he is impossible to ignore. The Hungarian Vizsla represents the best in both sporting dog and loving, loyal companion. He is the smallest of the all-round pointer-retriever breeds and size is undoubtedly one of his most attractive characteristics. 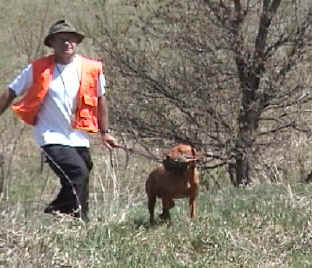 A Vizsla holds a unique position for a sporting dog – that of both house companion and family dog, and a close-working personal gundog in the field. He does not make a good kennel dog and only reaches full capacity as an enjoyable companion when he is a member of the family. Bred and owned originally by wealthy Hungarian landowners, Vizslas were always very privileged canines, holding a high place in the Hungarian sporting circles but not expected to sleep outside at the end of the day in the fields. 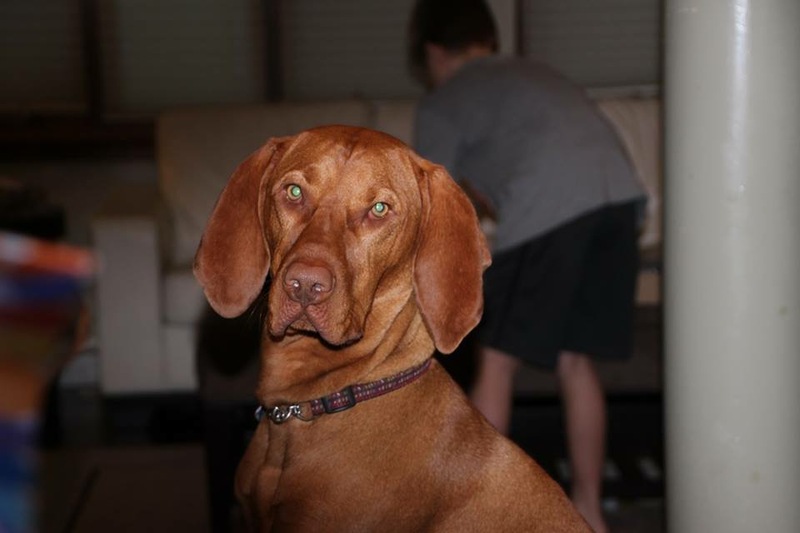 The Vizsla always lived and travelled with his family and was as much a family member as a child. A Vizsla is striking in appearance. His beautiful golden-rust color never fails to attract attention. He is a joy to watch in motion and he is just as enthusiastic about chasing a ball as a butterfly, leaf or squirrel. Still, he can freeze to a perfect pointing statue when he has quartered a birdfield and found game. A Vizsla is highly intelligent – do not ever underestimate the learning potential of a ten-week-old puppy. He is obedient and ever strides to please, but he gets bored without a challenge and something active to do. Because of his highly developed sense of humor and intelligence he not only can be taught easily, but can think up things to do on his own. A comfort seeker, a Vizsla would rather sleep on your bed than on the floor. He thinks sofas were made especially for him, and if allowed, will remain a lap dog for life. He will follow you around the house from room to room rather than be left alone for even a minute. If you put your Vizsla outside, he will sit on the doorstep begging for you to come out with him. In the field, a Vizsla combines all the attributes of the Pointer, Setter, and Retriever. He points by instinct, and is a very close-working dog, making him an ideal weekend companion gundog. He is fast, extremely birdy, enthusiastic, with a good nose. He has a soft mouth, retrieving game without damaging or marring, and is a diligent worker on upland game, with discriminating bird sense. His striking color in the field and quick, graceful movement make for an enjoyable combination. 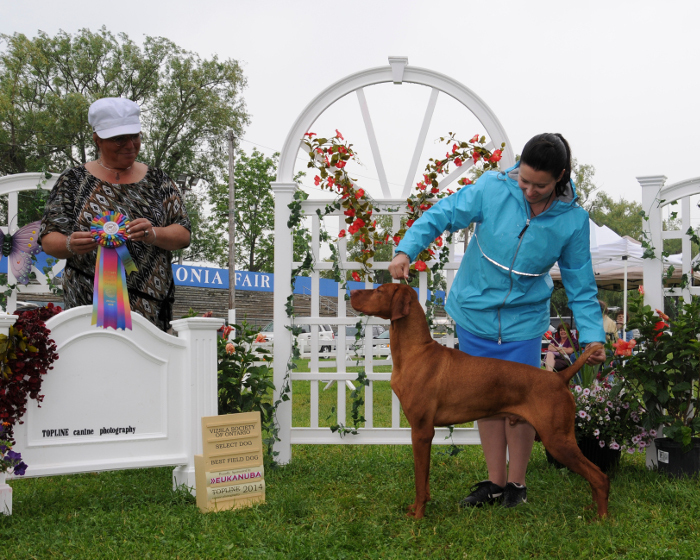 The Vizsla has become more popular in the show ring as his aristocratic appearance, dignified and balanced bearing, intelligence, animation, graceful carriage, and love of attention has attracted new enthusiasts. Once you own a Vizsla, you are hooked for life. Each new owner finds a new and different way to incorporate his dog into his own life. A Vizsla can cheerfully go backpacking, hiking, and camping and can accompany his owner to the office. He enjoys tobogganing in the snow and he loves water. A perfect companion on a boat trip or in a swimming pool at home, a Vizsla will be happy to swim or retrieve balls all day. He will even be content just to stand for hours in a shallow stream and silently watch small fish swim around him. As long as he is with his owner, he is a happy dog. As a trained obedience dog, a Vizsla can be used to educate and entertain at civic centers, county fairs, schools and nursing and retirement homes. He has been employed as a drug sniffer, a guide dog for the blind, and a hearing-impaired service dog. His easy care and willingness makes him an ideal choice for these tasks. Obedience and agility competition enthusiasts will tell you that these are where the Vizslas excels. He is a natural showman, and is never happier than when he has been given something to do. He is easily bored with the repetition of the beginning classes and training but will find his element in jumping and retrieving exercises. It comes as no surprise to Vizsla owners that the first dog in American Kennel Club history to earn a Triple Championship title for completing field, show, and obedience championships was a Vizsla. History repeated itself when the Vizsla was the first dog of any breed to earn a Quintuple Championship. The breed is truly versatile.